www.lanzbulldog.de - Forum • Thema anzeigen - Our 5506 when we got it a year ago. 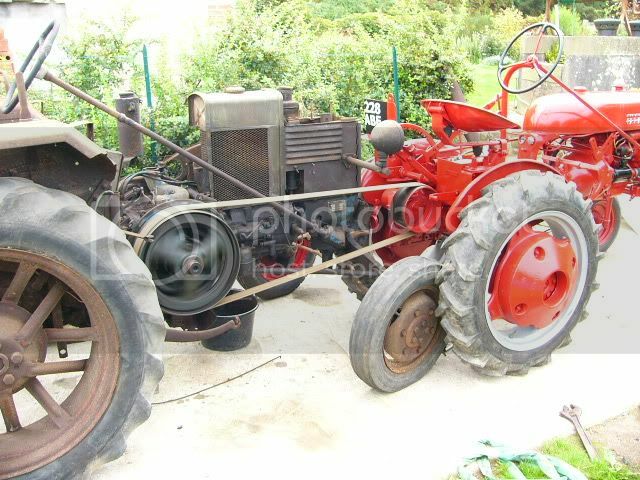 I will post a photo of it when it goes out in 10 days time to the National Old Time Ploughing Match at St Caradec here in Brittany. Does the engine still run? What about the gearbox and the rearend? What year of build is it? Have you worked on it allready? Can you send some new photos how it looks today? Hi and thanks for the replies. I am very pleased to be able to share a bit about our 5506 with you, I hope that more English speaking people will also share with us. 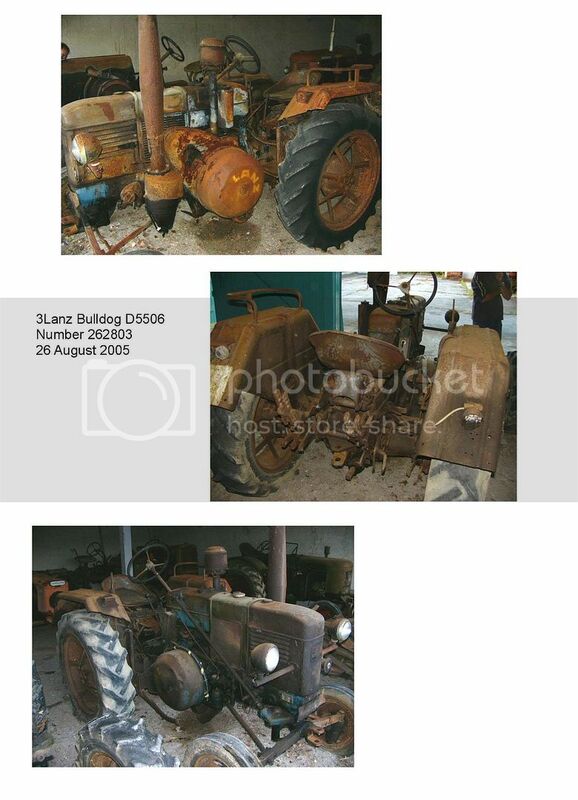 The 5506 was part of a large collection of Tractors that formed part of a museum here in Finistère France. It was open to the public, but due to mis-management and political pressure the museum closed some 3 years ago leaving the tractors and all sorts of agricultural equipment exactly as it was. In the mean time the owner of 80% of the stuff had to spend his life in a wheel-chair and lost interest in the affair. His grandson took over the "organisation" of the collection still all housed at the museum, the grounds and buildings of which are owned by the county council or "Conseil General". A number of us in the area tried without success to resurrect the museum,but it was not to be. There were 2 Lanz and a Percheron there. I bought the 5506 in a very sorry state having been half outside for ^perhaps 20 years, the other one earlier than ours went to a friend near St Malo Fr. The Percheron I am trying to see if I can bring the price down to a reasonable level to buy and restore. Got the 5506 home, it turns but without compression. Took Inlet valve to pieces and cleaned and straitened the disk and that helped, but still no real compression. Lots of oil and diesel in the cylinder and backed our Farmall Cub "Baby" up to the lanz with a flat belt and turned the engine over at about 300Rpm for about an hour, adding oil regularly. After this the engine had a bit of compression, so I decided to put a bit of diesel in the tank, of course some helpful person had taken 2 of the banjo-bolts off the master fuel tap and I had to find a couple and some copper washers, primed the system and injector, found a gas blow-lamp and heated the bulb up for a while. Acelorator fully open, (I should say here that I drained out the excess oil from the crankcase and ensured that the oil pump was pumping) 5 primes on the injector pump, and turned the flywheel....Bonk! Well that was encouraging, so tried again a,d after about 10 minutes it ran, in reverse of course, but it ran and I soon got it going in the right direction. Lots of smoke and difficult to let the engine idle much under 700RPM, but it ran, I did a turn around the village and up the very steep access road to us and left a very interesting black smoke trail behind me! Shame no camera at the time. So it runs, what to do, this was september 2005, weather quite fine, let's start dismantling, this was in the open before getting it into the tractor shed, and as the weather deteriorated so did the interest. So after the winter I pushed it into the tractor shed and dismantled the majority except the gearbox which seemed quite quiet during the "test" run. New main bearings, I re-doctored the big end, made a new little end bearing, new piston rings rebuilt many of the pins and axes in the clutch and regulator. The bronze lining to the eccentric that runs the injector pump was in a very bad condition so I had to turn another and fit it. I started putting it back together. Sand blasted wheels which left quite a lot of holes in the back wheels which I spent a couple of days welding up, repainted and retyred, red and a royal blue for the tractor. Now although I like to give a good finish and a good mechanical works, I am not one who tries to give the tractor a "Just out of the factory" look, unless safety is prejudiced, I do not reweld small panels such as the foot boards that have the wear of years on them, for me that is part of the history of that particular machine or tractor. So you will find rust (well treated and coats of paint) holes in certain panels, but that's just me. This photo shows progress about 3 months ago. I need to take a few more now once it is nearing completion. 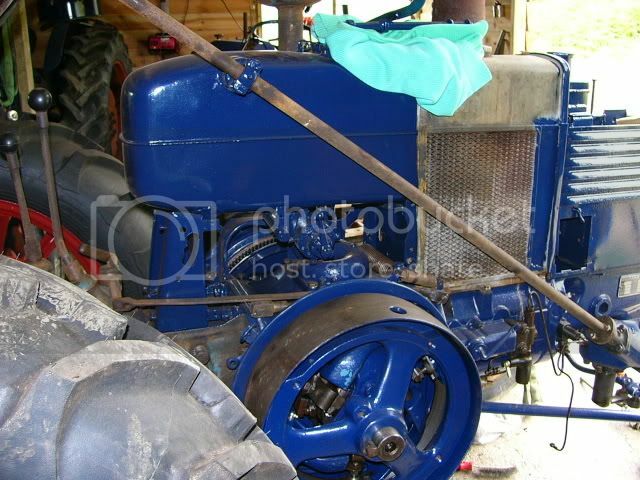 We are hoping to get far enough done to take it to St Caradec in Cote d'armor Brittany in a couple of weeks to the National Vintage Ploughhing Match Regional Heats, where there are usually quite a lot of Lanz Tractors, and the majority use trailer ploughs. We will take our Mc Cormick 2 furrow trailer with us but not to be part of the championships. So My friends that is where we are at the moment. The next tractor after 5506 is the Lanz 2816 JD Lanz which I bought having been siezed for about 20 years, I have not taken it to pieces yet!!!! That will be another story I will be very happy to share with you as it progresses. PS the regulator/govenor is all open inside the RH flywheel. 20 years outdoor and the engine still runs, that`s fine. Good luck to you while the championchip in England and I`d be happy to read somthing more about the restoration.